When is it okay to start Christmas music, shopping, and pictures with Santa? We start seeing red and green sometimes in September. Certainly as soon as Halloween decorations come down, the stores are full of Christmas everything. In, Lee’s Summit, a big start to the Christmas holiday season started Saturday, November 10th, and our office was there. No, we didn’t have an office shopping spree. (Not that that’s a bad idea!) What we did do was participate in the Healthy for the Holidays Community Health Fair held in conjunction with the Lee’s Summit Holly Festival Craft Fair. To be honest, most (if not all) were at the fair for the shopping. With two gyms, a commons area, and several hallways at Bernard Campbell Junior High full of booths, there was plenty to pick from. There was a plethora of clothing, crafts, home décor, jewelry, toys, and more. So, we definitely had some competition. We made first aid kits with the kids, which they loved, and actually many of the older patrons asked about as well. 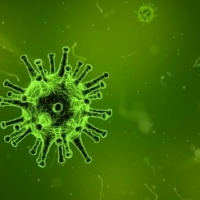 In fact, many of those adults offered up that they used to bring their kids (now grown) to us, or they themselves use our internal medicine office. We let them make first aid kits too. I mean, at Christmas aren’t we all kids at heart?! We also had information about Fit-tastic, a program from the CDC that talks about healthy living and appropriate amounts of exercise, screen time, milk, water, and fruits/veggies for our kids. There was less interest in this, however the handouts were well received. I mean really, who wants to think of fruits and veggies when it’s cookies and candy cane season! The answer to that first question of when to start thinking “Christmas” is really whenever we want. The spirit was definitely there, and we were part of it. All in all, I think our first involvement in the Lee’s Summit Health Fair/Holly Fair was a huge success. 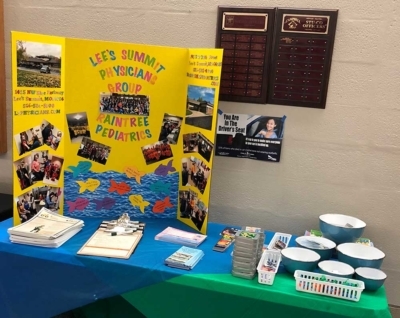 It was fun, we provided some education and put a face to the name of Lee’s Summit Physicians Group and Raintree Pediatrics. 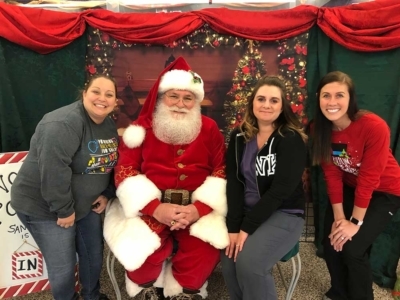 We enjoyed a little Christmas spirit! 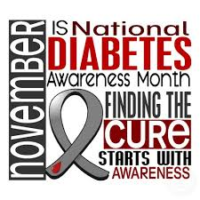 November is Diabetes Awareness Month Mystery virus causing paralysis? What parents need to know.